Image Compressor Pro is an award-winning compression software that is designed to compress all the photos into JPEG without changing the image quality. With Image Compressor Pro, users can easily import photo, capture screen, retouch photo, compare, automatically compress photos, creates Flash animated web photo albums, share photos, and convert images. 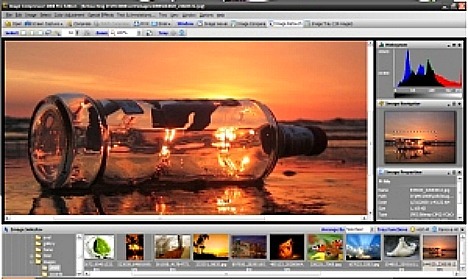 In addition, Image Compressor Pro also provides image resizing tool, rotating, thumbnail creation, and watermarking that can be done in batch mode. 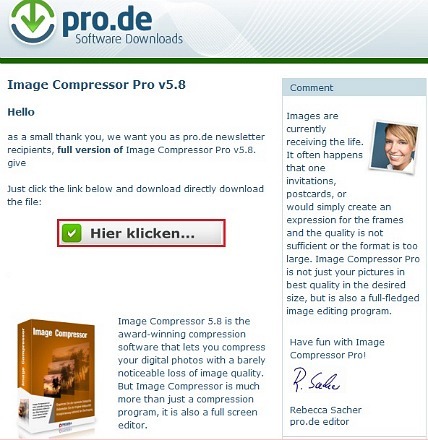 Click on “Hier klicken…” button to direct download the Image Compressor Pro Version 5.8 setup installer as shown in below image. The license key code is show at page: 8D08-A672-7078-56E0-53A9. Use the serial number to unlock and activate Image Compressor Pro 5.8. Note: The serial number is same for everyone. Image Compressor Pro Version 5.8 supports Windows 2000, XP, Vista, and Windows 7.